After Dillon Dobson got back to the bench following his second solo shot for Class A Advanced San Jose on Friday, his teammates issued an unusual dare. The Giants second baseman had hit one over the right field fence in the first inning and launched another in the sixth, this time to left. "The guys were kind of challenging me to see if I could get one out to center, but I wasn't quite sure if I had the juice to do that," Dobson said. 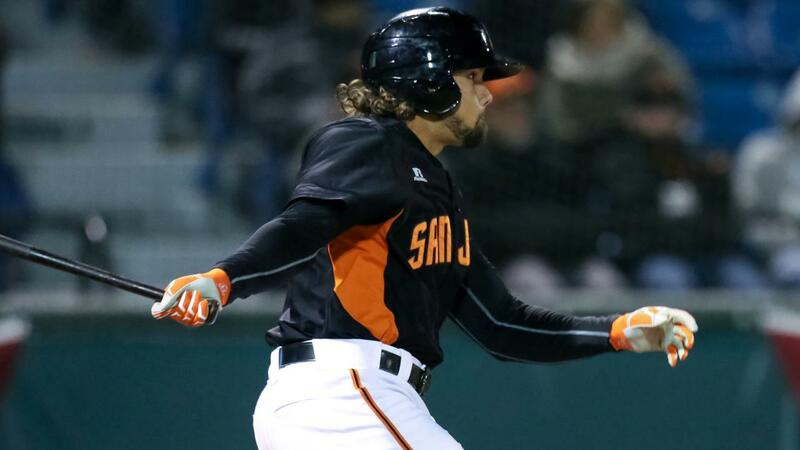 Despite his own doubts, Dobson belted a changeup from Brett Graves over the center field fence in the seventh for the Giants' first three-homer game in nearly six years, helping San Jose roll to an 11-4 victory over Stockton at Municipal Stadium. "You hit one and you know it's not too crazy, you hit two and you know that's a pretty good game," Dobson said. "You just try to stay focused for the last one. You don't really try to do too much, but I ran into it and put a pretty good swing on it. It was the third homer hat trick in the 30-year history of the franchise, the first since Hector Sanchez on May 23, 2011 and the first at home. The Appalachian State product had gone yard twice in a game on three occasions in college but never got to three. His first homer Friday was the second of back-to-back shots following Gio Brusa's two-run blast in the first off Casey Meisner, the A's 29th-ranked prospect. His second came against Graves on the first pitch of his at-bat in the sixth. Dobson entered the contest with one homer in 12 games this season. His third roundtripper Friday night was the exclamation point on a five-run, two-out outburst in the seventh. "I was kind of looking just to take the first pitch because I swung first pitch on the at-bat before against [Graves] and he's a pretty good pitcher, so I was taking the first one to get my timing back down," Dobson said. "Then [the first pitch] was a ball away and he came with a fastball in for a strike and I knew he probably wasn't going to throw another fastball, so I was sitting outer part of the zone and he threw a changeup and I put a pretty good swing on it and stayed through it." The excitement of the third homer for North Carolina native was made even sweeter by meeting his teammates' challenge. "I kind of got lucky and it ran out to center," Dobson said. "It was pretty cool to complete the trifecta, I guess." Dobson went 4-for-4, adding a single in the fourth and scoring on a base hit by Jose Vizcaino Jr. He was activated from the seven-day disabled list for Thursday night's game against Stockton, in which he went 1-for-4 with a run scored. The 2015 23rd-round pick was sidelined after taking a pitch from Joel Payamps off his elbow in a game against Visalia a week ago. "I'm seeing good pitches, staying simple and not trying to do too much. When you get home run-happy, you tend to do too much and don't really square the ball up," Dobson said. "I've been able to sit back and kind of work on my mechanics a little more. But I'm just trying to stay as simple as possible and see the ball deep and put a good swing on it and be consistent." Brusa scored three times and drove in three runs, while Ryan Howard singled twice -- one to plate a run in the seventh -- and scored twice for San Jose. Tyler Ramirez had hits and two RBIs and A's No. 30 prospect Skye Bolt hit a solo shot for the Ports.